• Herbaceous ecosystems occur in areas of coarse shallow soils and bedrock found on exposed hilltops and headlands, on mossy outcrops in forest openings, and on shorelines outside of the salt spray zone. • They are characterized by continuous low lying vegetation and diverse species including grasses, herbs, wildflowers, mosses and lichens. Herbaceous ecosystems have very few (<10%) trees and shrubs because their shallow and fast-drying soils limit the growth of larger plants. • Herbaceous ecosystems frequently form patchy mosaics with Sparsely Vegetated, Woodland, and other ecosystems. DIEM has mapped Herbaceous ecosystems ochre in the Sensitive Ecosystems Mapping. A herbaceous plant is one without a woody stem and that typically dies back at the end of the growing season. Some herbaceous species have underground parts (rhizomes and roots, bulbs, corms) that survive through winter, so this grouping of plants includes annuals, biennials, and perennials. 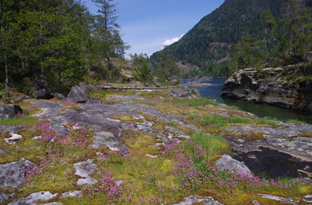 In the Discovery Islands, herbaceous ecosystems most frequently occur as moss and lichen meadows on rocky outcrops. They often feature a variety of hummocks, hollows, and vernal pools. These are lingering moisture sources—and key amphibian habitat—as the surrounding vegetation dries in the summer. In the moist springtime, the Discovery Islands’ herbaceous ecosystems support abundant displays of rare and delicate wildflowers. 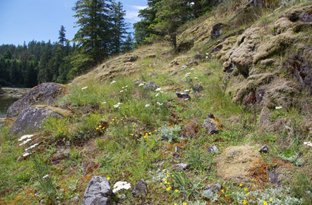 Herbaceous ecosystems also provide highly specialized micro-habitats for many species of rare butterflies and lichens. The lifecycles of certain rare species depend entirely on the specific conditions found in extremely small locations (some with an area of a few square centimetres) within these fragile ecosystems where any disturbance is amplified by wind, rain, and drought. 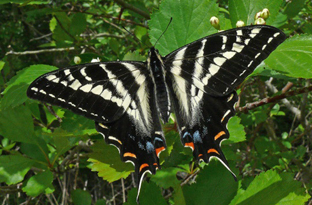 The largest butterfly in this area, is an active flyer and is often seen in spring and early summer in open areas seeking mates, nectar flowers or larval foodplants. Red alder is a principle choice for egg-laying on the coast. 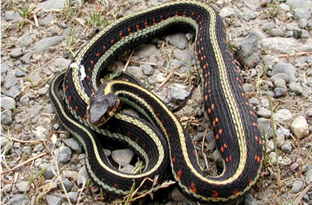 The common garter snake is a common site hunting or basking in sunny openings or moving through forest edges. Their winter hibernacula-habitat is critical as they may travel several kilometres to reach these special winter sites that they share with other snakes. 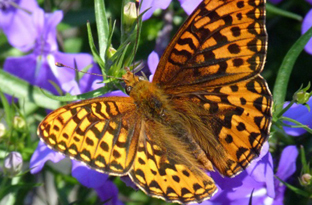 Hydaspe fritillaries fly later in the summer, from June on. Violets are the foodplant for caterpillars and the butterfly nectars on many summer flowers in open areas. They are long-winged skillful flyers. 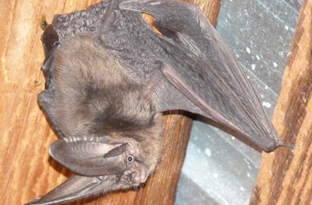 Their sophisticated sonar enables them to glean resting insects off vegetation in open meadows at night. 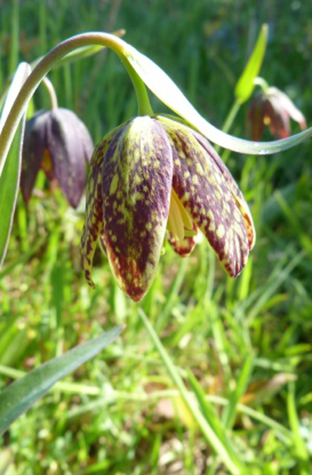 Chocolate lilies grow from tiny rice-like white bulbs and become prolific in suitable meadow and woodland habitats. The bulbs were eaten by coastal First Nations, but have a somewhat bitter taste. 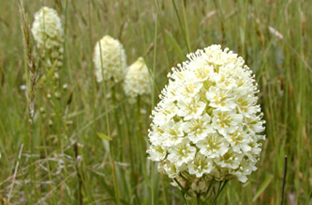 The common camas bulb was once important as a staple food of coastal First Nations. Bulbs were cooked in steam pits to make the long-chain sugar, inulin, more digestible. Less numerous today due to development and farming, the distinct blue spikes grow thickly in remaining coastal meadows. 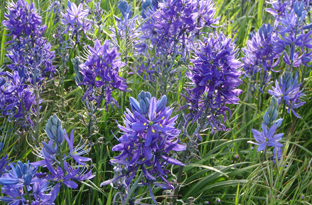 They grow with blue camas in moist spring meadows. The leaves and bulbs are highly poisonous. 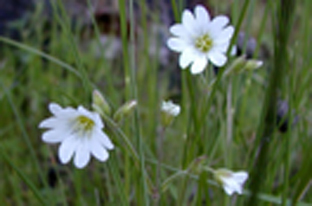 This is a delicate showy white-flowered ground-cover in meadows and rocky outcrops. Stems that trail over the ground with attractive short greyish-green opposite leaves. 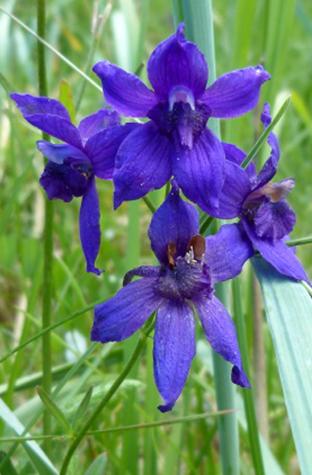 It grows in sparse rocky habitat, yet it’s lovely deep purple-blue flowers are best known for colouring natural meadows. These plants may contain a highly toxic compound, delphinine, dangerous to both grazers and humans. It appears similar to arbutus with its distinctive red bark. But the greyish-green leaves are very hairy and manzanita is rarely taller than 3 m. Berries may cause severe constipation. 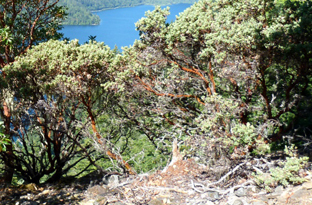 Manzanita can hybridize with kinnikinnik and produce a mixed low shrub. 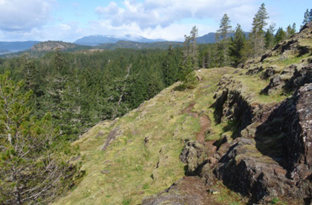 Familiar Locations: Cortes Island: Easter Bluff, Quadra Island: Heriot Ridge, Read Island: Viner Point, Maurelle Island: The Dome, Sonora Island.